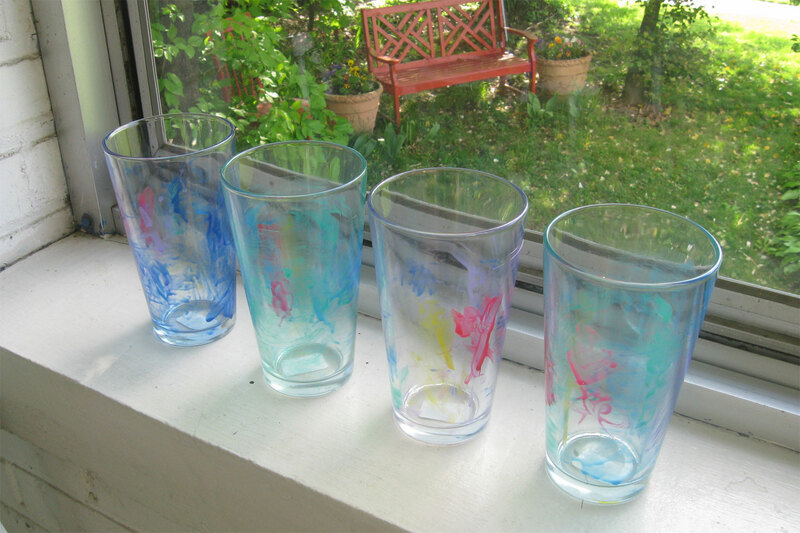 Dorothy and I had so much fun with the porcelain pens we decided to try our hand at glass paints. Rob and I have been breaking our way through all the drinking glasses we got for our wedding seven years ago, and I thought maybe it was time to stop replacing them with the same old models from Bed, Bath and Beyond and introduce a little handmade charm to our glassware situation. So I bought some basic, sturdy glasses from the Dollar Tree, then let Dorothy have at it with the glass paints. I applied electrical tape to the area around the rim, because you’re not supposed to use the paints on the areas with food contact. I think these turned out quite lovely (she decided to go abstract rather than paint figures like she usually does) and I’ll probably buy another four to round out our collection. I got in on the fun a bit too, painting the recyled glass lemonade jugs we use to store cold water in the fridge (not pictured). The paint is supposed to dry for ten days, so we’re looking forward to a lovely day in May when we can sip iced tea from our new creations. 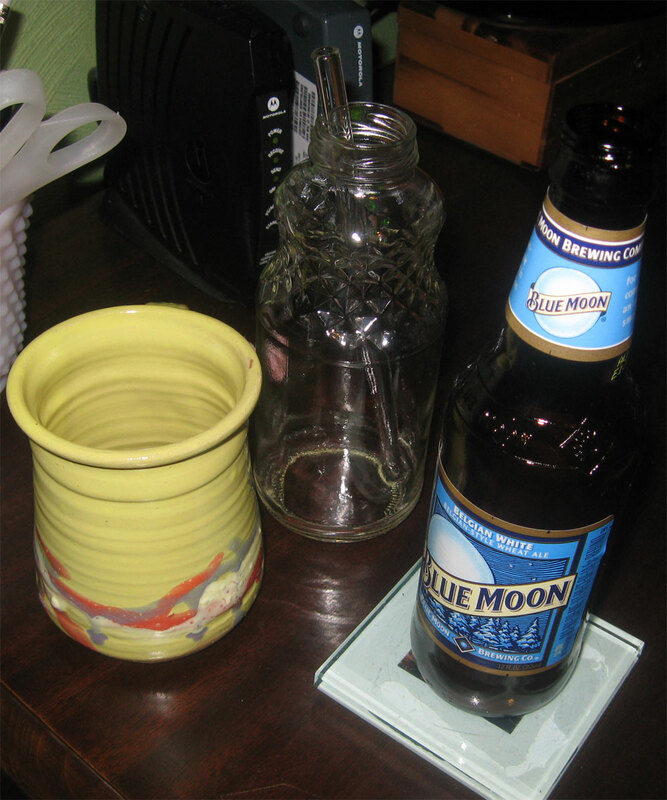 Speaking of glasses and other drinking vessels, this is what I encountered at my computer desk last night when I was straightening up at the end of the day. It made me laugh becuase it was a history of my day in drinks–the morning coffee, which got booted off the coaster to make room for the jar of water (with lovely glass straw from this website), which then got booted to make way for the evening’s beer. A good day indeed, although the photo does leave out the afternoon caffeine fix from the Java Company.